But after a while I began to wonder. Clearly many people did ride down the ledge. The tire tracks to and from the feature were evidence of that. And it really wasn’t that steep, was it? You just needed to allow your bike to roll over the smooth ledge, right? Unfortunately, it wasn’t that easy for me. I tried a few times, but each time I’d stop at the top and change my mind. The rock began to taunt me every time I was on the trail. I began to doubt I’d ever have the gumption to put my fears aside and go for it. Eventually, the rock ledge became my nemesis. But a nemesis is meant to be faced and conquered. My instincts told me that I could ride the ledge if someone showed me exactly how to do it. In this case my fear was a good thing—I didn’t have the confidence to try the feature because I wasn’t sure how to ride it. So I decided that it was time for a professional mountain bike lesson. After a little research I contacted Amanda Ridgway, the founder and managing director of Drift Mountain Biking. Based out of Cumberland but serving the entire Island, Drift is the only business on Vancouver Island that specializes in mountain bike instruction. Ridgway asked around and many people told her that she needed to check out Vancouver Island. “I had one friend who said that I just HAD to visit Cumberland on the Island,” Ridgway recalls. So she took a trip out to Cumberland, scoped out the Village, explored the trails, and decided that Cumberland was a good place to pursue her dreams. After a lot of careful consideration, Ridgway decided to start a mountain bike school. “I knew that I wanted to do something related to mountain biking, but I wasn’t sure what that looked like,” she says. So she did a needs assessment—carefully looking at what the Island had to offer and focusing on the gaps that existed. Many riders say that if you can comfortably ride the trails of BC, then you can ride just about anything. That’s because, like most of BC’s trails, many of Cumberland’s trails are technical and challenging. Boardwalks, teeter-totters, skinnies, A-frames, roots and rocks, and of course, rock ledges like my nemesis, are all common features. And that’s where Drift comes in. Ridgway believes that proper instruction is integral to getting the most out of mountain biking. “At this point, most people feel that they can just learn as they go, but getting to the point where you can fully enjoy the trails the way they’re meant to be ridden—that takes a long time, unless you get some instruction. It is also important to get that instruction from someone who really knows what they’re doing. “Mountain biking has changed a lot over the years. The old ‘get behind your seat’ or ‘don’t use your front brake’ doesn’t necessarily apply anymore. “Specifically, what your biking buddy tells you may not be the right information,” Ridgway says. Drift’s instructors use specially constructed wooden ramps and ledges when they instruct at the park. These handmade features can be gradually raised and lowered to increase the student’s confidence and to help the students become more comfortable with features they’re bound to see on the trails, such as boardwalks, A-frames, ramps, and skinnies. The fact that the student actually rode features on the grassy field gives the rider an added boost of confidence when they see similar features out on the trails. 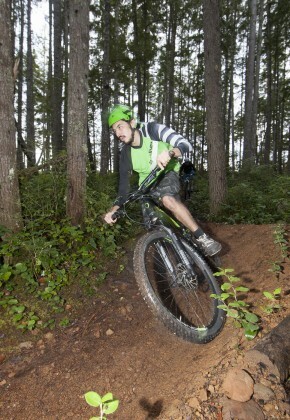 Drift can also be of interest to riders who consider themselves quite competent on the trails. “For more intermediate or advanced riders, we may head straight to the trails and perform an assessment with them as they ride. Then we create ride plans and drills to meet their goals—challenging clients just enough and having fun all the while,” adds Ridgway. You may be wondering about that rock ledge I mentioned earlier—my nemesis. I spent an enjoyable afternoon with Ridgway in Village Park, where she helped me to correct my stance. I also rode the wooden ramps which were set up to simulate the rock ledge. After my session with Ridgway, I knew just how to approach and ride over the rock ledge. I had confidence, but that confidence was based on knowledge—and I was ready to face my nemesis. I took a deep breath and I rode over the feature just as I visualized myself riding it. And just like Ridgway predicted, it wasn’t as hard as I expected it to be. In fact, it was a lot of fun.